USPS is keen on expanding its Alternative Access options no matter what, with the ultimate plan of reducing its full-time staff and brick-and-mortar infrastructure. The best Alternative Access channel USPS has is a CPU, though other options include VPOs, Office Max things, Approved Shippers, and partners (read: every large retailer) that sell stamps on consignment. One alternative that splits the difference between diminished infrastructure and reductions in staff are Post Office Express (POE) operations, whereupon a USPS-staffed finance unit takes residence in a large supermarket operation. The store gets increased foot traffic and the Postal Service gets a prime location in a well-visited location. The option never really took hold and there are but a few of these operations in the country. The only active operations lie in the Las Vegas area and Albuquerque. This post focuses on the former. The program was conceived and introduced by USPS Headquarters in the mid-1990s, with most POE operations opening for business in 1995 and 1996. In Las Vegas the program served to mitigate the loss of two large Contract Postal Unit contracts: a set of Hallmark franchises and Smith's Food & Drug. The original Post Office Express locations in Las Vegas, of which there were about a dozen, appeared in Lucky Stores, a local chain of supermarkets. The chain underwent two buyouts and its operations since became Albertson's supermarkets. Several POE operations have since closed during store relocation or renovations; four POE operations in the area, all in Albertson's supermarkets, remain. 4420 East Bonanza Rd., 89110: "POST OFFICE EXPRESS"
6140 West Lake Mead Blvd., 89108: "POST OFFICE EXPRESS"
4801 Spring Mountain Rd., 89102: "IN FRONT OF LUCKY'S POE (INSIDE)"
2300 East Tropicana Ave., 89119: "POST OFFICE EXPRESS"
The author has visited the four active Post Office Express operations in Las Vegas, and anyone can find out more information about the facilities using USPS's Leased Facilities Report. The best part is that for these operations USPS pays nothing in rent. Okay, sometimes it pays $1 a year. Building maintenance is handled by the landlord, not by USPS itself. Below is a photo of one such operation, POE #683 (a.k.a. Warm Springs POE). You'll observe that the postal space can be fully closed off from the rest of the store using a sliding / accordion metal barricade. A blue collection box rests outside the door. An exterior photo of the Albertson's is also shown; three of the four operations are signed by USPS Sonic Eagle logos outside. Henderson, NV: Horizon Ridge POE (POE Henderson); 2650 W Horizon Ridge Pkwy., 89052. 1,100 sq. ft., $0.00 rent. Las Vegas, NV: West Cheyenne POE (POE #695); 8350 W Cheyenne Ave., 89129. 570 sq. ft., $1.00 rent. Las Vegas, NV: West Flamingo POE; 10140 W Flamingo Rd., 89147. 923 sq. ft., $0.00 rent. Las Vegas, NV: Warm Springs POE (POE #683); 7271 S Eastern Ave., 89119. 751 sq. ft., $1.00 rent. By contrast, Las Vegas's Airport Retail Unit occupies 1,056 square feet with a rent of $21,360. Most leased facilities in the Las Vegas area are leased for $15 to $21 per square foot. Freedom of Information Act requests are fun. The primary costs of operation for Post Office Express locations lay with staffing, and there are two concerns in this regard: 1) the hours of operation are long and (in three cases) continuous, a situation which calls for multiple employees. 2) Customer traffic fluctuates throughout the day. At the West Flamingo Post Office Express operation, the line was out the door at opening time. At POE #683, southeast of McCarran, I arrived after 5 p.m. on a Saturday afternoon, and I was definitely the only patron. At post offices with full carrier operations, there is other work a clerk could do during customer traffic lulls; not so at POE locations. Now, here are some photos! Albuquerque's three Post Office Express locations are not free of rent; in fact, the locations (at Smith's Food & Drug stores; sound familiar?) are rented for about $29 per square foot, about $21,000 to $34,000 per year. Carson City, NV also housed a Post Office Express location by way of a Super Kmart Center store (at 3456 N. Carson St.) that was discontinued May 2003. (The POE closed Feb. 23, 2003.) One old Geocities page documents this fact. (Ah, GeoCities. Remember those days?) Declared "the busiest K-Mart Store [storewanderer] had ever seen," the location "had no other competition on its side of town other than an Albertsons and a Safeway." The store advertised its POE on its large exterior signage. The POE, storewanderer declared, "was another thing lost by North Carson upon closure of this store." The L.A. Times noted in 1995 that this was not the only Kmart to maintain a Post Office Express; "In Fresno, Carson City and Lincoln Park near Detroit, full-service post offices are inside Super Kmart stores. Called "Post Office Express," they are open whenever the store is open, seven days a week. More will open soon in Nashville supermarkets." 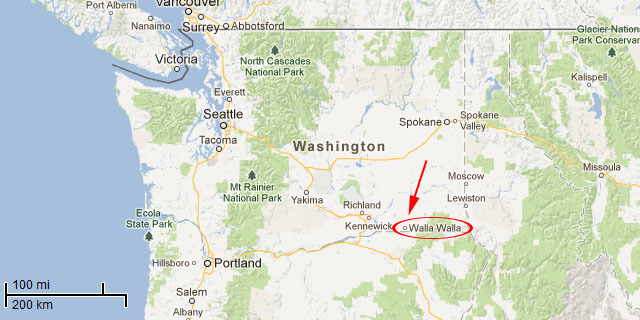 With 32,000 residents, Walla Walla is the seat of the county of the same name. While not huge by our standards, but it was big enough to earn a fantastic 1910s post office, which is still in use today. The cornerstone reads MCMXII (1912), and according to a description by courthouselover over on Flickr, the building "completed in 1914 using the designs of supervising architects James Knox Taylor and Oscar Wenderoth. It is still in use by the U.S. District Court for the Eastern District of Washington." A rear extension to the building was added in the same style as the original. Sadly, the interior has since been renovate in a way that greatly diminishes its character, though you the old-style P.O. Boxes are still available. 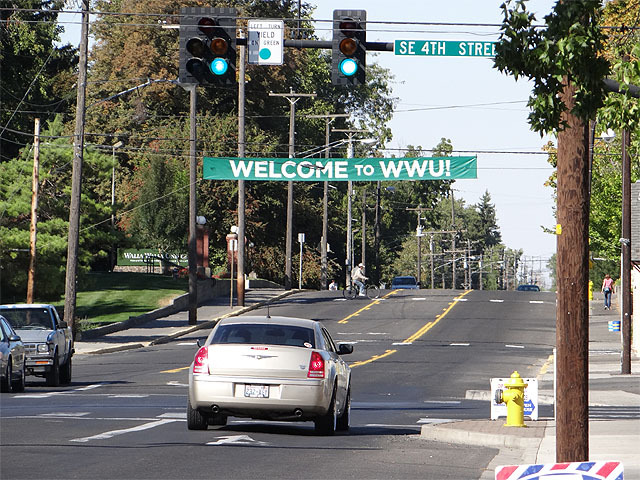 The Walla Walla area is home to three local colleges: Whitman College, Walla Walla Community College (WWCC), and Walla Walla University (WWU) -- or, as I like to call it, "Quintuple-U". The latter is located in the adjacent town of College Place. Other nearby sites include the National Park Service's Whitman Mission National Historic Site. 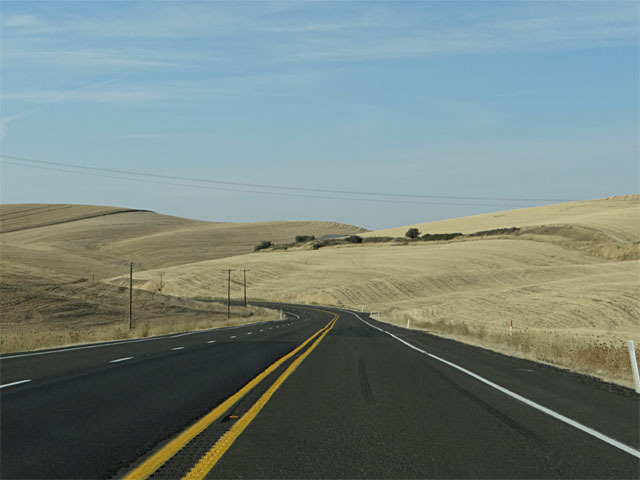 I'll leave you with a scene from the road east of Walla Walla. As of 1:00 PM, April 2, 2013, I have been to 5,000 distinct postal facilities. 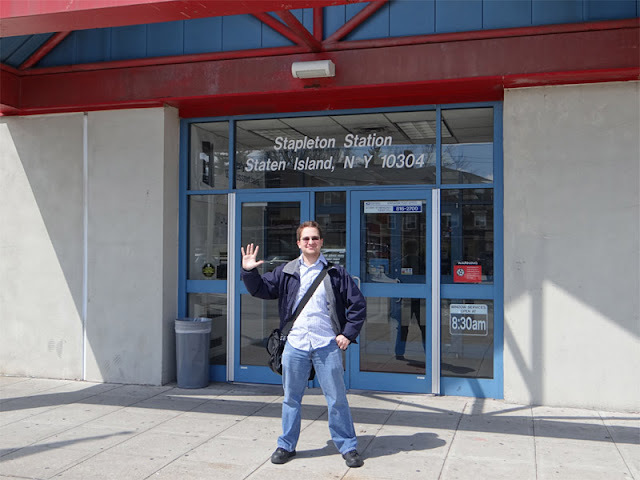 This milestone came in the form of Staten Island's Stapleton Station post office. I might have wished for a post office in Alaska or Supai, Arizona, but what can you do? Fortunately, this office was not devoid of character. Staten Island, or as some New Yorkers consider it, the Forgotten Borough, houses some beautiful architecture and communities that have not lost their old-town feel. There's also some great pizza; my father and I ate at Denino's. Based on what a local firefighting company and families had ordered, the half-sausage pizza seemed to be the way to go. The crust was thin but crispy. The mozzarella is made fresh each day and the sausage possessed a fantastic note of fennel. Staten Island's Saint George neighborhood is what one might call the island's "downtown". It's home to Borough Hall and municipal courthouses; one terminus of the Staten Island Ferry; the ballpark for the Staten Island Yankees; and, of course, the federal building housing the former Staten Island Main Post Office, built 1931. The old Staten Island MPO still houses the Saint George Station post office, in addition to a recruiting station for all branches of the U.S. military. The post office houses classic Depression-era interior, with marble columns and Corinthian tops. Saint George Station was renamed Sgt. Angel Mendez Post Office by act of Congress, named after a soldier who died in Vietnam, and the post office's cancellation reflects this name change. The building, at 45 Bay Street, also houses the Staten Island Postmaster's office, though the Staten Island General Post Office (and formerly Staten Island P&DF) lies inland. A few hundred feet away lies another post office! The Ferry Terminal Station post office lies within the mall on the second floor of the terminal at 3 Ferry Terminal Dr. Thanks for reading! Hope you're still following at 10k.